This behavior provides an insight into the sheer callousness of some people. Nonetheless, this provides a good example to remember what has happened in Puerto Rico, as they now face an impending food crisis, as funding for food assistance runs out. Should that happen, we will need to start calculations of excess fatalities, based on Mr. Trump’s niggardliness and racism. For now, a recap of excess casualties including the official estimates, and those I calculated. 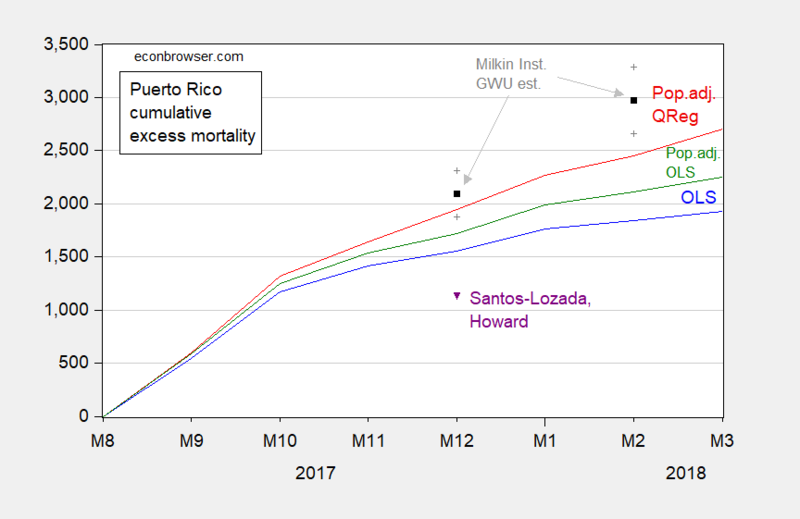 Figure 1: Cumulative excess deaths from September 2017, for simple time dummies OLS model (blue), OLS model adjusting for population (green), and Quantile Regression model adjusting for population (red), Milken Institute point estimate (black) and 95% confidence interval (gray +), Santos-Lozada, Howard letter (purple). Source: author’s calculations, Milken Institute (2018), Santos-Lozada and Howard (2018). My methodology is reported here. Mr. Trump has not pointed to any documentation to substantiate his skepticism regarding the official estimate of the Commonwealth of Puerto Rico.